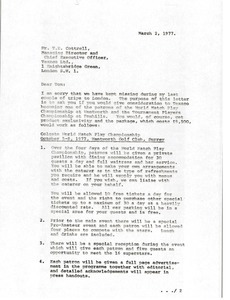 Great Britain - Proposing Texaco become a patron for the Colgate World Match Play Championship at Wentworth and the Tournament Players Championship at Foxhills. McCormack outlines proposed details for each event. Great Britain - Proposing Weetabix become a patron for the World Match Play Championship at Wentworth and the Tournament Players Championship at Foxhills. McCormack outlines proposed details for each event and asks for Plackett's assistance in bringing it about. 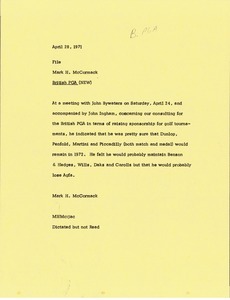 Great Britain - Confirming an arrangement to provide a sword-type trophy for the British PGA Tournament Players Championship and proposing an idea for use with Bryant, May and Foster Grant. 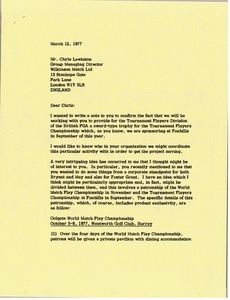 McCormack proposes they become of the Colgate World Match Play Championship and the Tournament Players Championship. 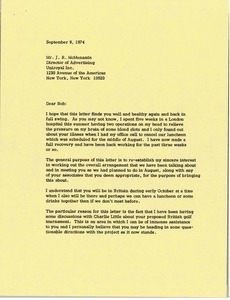 The details are summarized for each as well as the benefits and costs. Great Britain - Proposing British-American Tobaccoo become a patron of the Colgate World Match Play Championship at Wentworth and the Tournament Players Championship at Foxhills. McCormack outlines proposed details for each event. 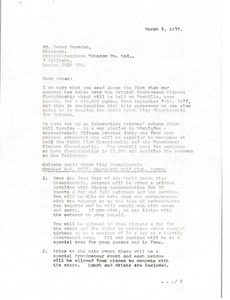 Great Britain - Concerning the consulting for the British PGA and sponsorship of golf tournaments. 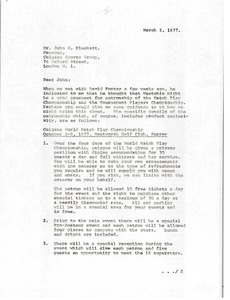 McCormack notes sponsors that will be retained and lost for 1972. 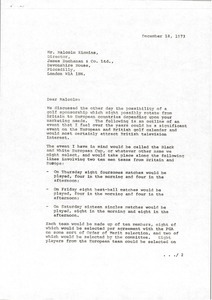 Great Britain - Discussing a golf sponsorship. 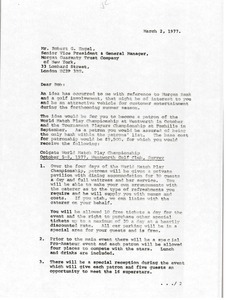 McCormack suggests the event be called the Black and White European Cup involving two ten men teams from Britain and Europe with a total of 18,200 pounds as prize money. Great Britain - Proposing Morgan Guaranty Trust Company of New York become the only bank patron for the Colgate World Match Play Championship at Wentworth and the Tournament Players Championship at Foxhills. McCormack outlines proposed details for each event.